Step 1 Place the turkey carcass, meatiest side down, in a large stockpot. Fill the pot halfway with water. Bring to a boil and skim any scum off the surface. Reduce the heat and simmer 30 minutes. Remove the carcass to a carving board; let it sit until cool enough to handle. Step 2 Add the onion, carrots, celery, parsley, peppercorns and bay leaf to the water in the stockpot and continue simmering. Step 3Shred or cut any remaining meat off the carcass and set it aside in a bowl; cover and refrigerate. Step 4Return the bones to the stockpot and continue simmering, adding just enough water every hour to cover. Cook until the stock is rich and aromatic, at least 3 hours or up to 6. In Recipes-list.com we have selected the most viewed recipes from category - Leftovers Main courses . Enjoy the best recipes specially selected for you! 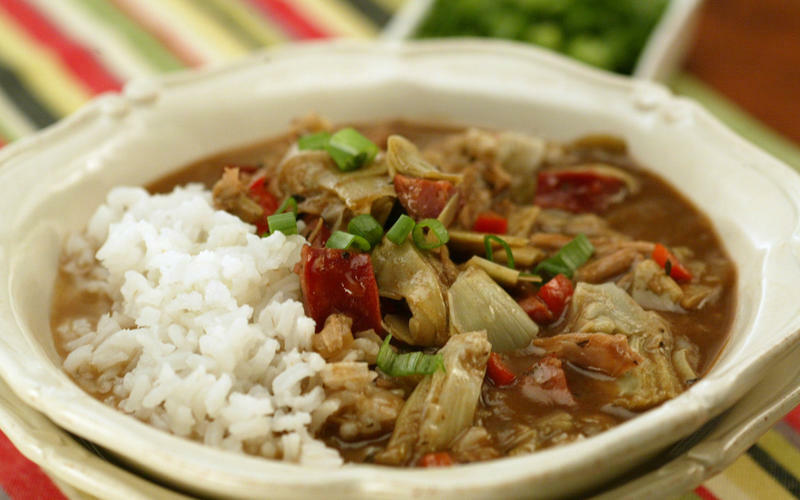 Turkey gumbo with artichokes and andouille is the right choice that will satisfy all your claims.